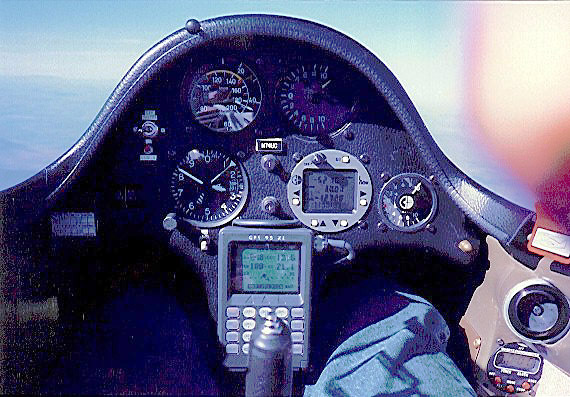 Into thin air with varios "pegged" at ten plus knots, going through 13,000 ft (click image for a full size version)! One thing that doesn't get much airtime in this sport is how hard it is to put together the time and people to make a trek to a different soaring site. But a bunch of us from the Nutmeg Soaring Association did just that in the second week of October, and despite the difficulty of making it happen, it's worth it. I was recovering from jet lag and my wife Barbara prescribed a Season ending soaring trip. A few calls the night before and I teamed up with Peter Scarpelli and his Mosquito, for the drive up. And it was quite a drive. We were headed for Gorham NH, just beyond Mt. Washington, one of the highest mountains in the East. The whole day would be spent driving. We were on the edge of a Nor'easter, the forecast calling for it to be gone by the next day, the winds kicking up behind an accompanying cold front. We were in search of wave. High surface winds, within reason, are good, as they signal a wind at the summit sufficient to give birth to the wave. Other things make the wave go higher still, but for once the phrase "Wassamatta, da wind quit?" had some meaning. Too much wind though, and you couldn't put the gliders together and handle them on the ground. As we pulled through the White Mountains, the peaks were impressive, even now, partially draped in cloud. An added bonus was the foliage at its most spectacular. It was easy to find the Gorham airport, it was 50 yards from downtown. The inevitable bumpy, albeit short, dirt road revealed ships but no owners, all familiar numbers. Felt like Old Home Week. In the approaching darkness, the field looked tiny, surrounded by hills. With only the barest of amenities, it seemed not to be the place for significant others with nothing to do. But it would be the launching spot for who knows what adventure, and there was the lure. With some kind of radar, Peter and I ended up at a restaurant and found the group already there. It was nice to see familiar faces in a strange place. We all launched into stories and shared experiences. We FNG's (new guys) were already picking up hints from the Old Hats. Up the next day to howling winds, slowly clearing skies and bitter cold. Rather than rig, we got a briefing by driving up to Pinkham Notch, the starting point for a lot of hikers. Two of our members have hiked here for years and their familiarity was invaluable. Inside Pinkham Lodge is a 10-foot square model with the Presidential Range laid out in relief. We took over the room for half an hour, hands motioning to show where the lift will be, how to get back to the airport, where the rotor and sink could be trouble. Our group confused the hikers around us, I'm sure. A good learning experience, though, pointing out the geography and how quickly the weather can change in the mountains. "I thought the wave just kind of surfed over the top", one of us confessed. "I didn't realize it comes down on this side and goes "BOING! ", back up into the stratosphere! I guess this isn't our benign home field in Connecticut". We traipsed outside and turned to watch Mt. Washington taunt us. It appeared and disappeared in the snow filled cap cloud within minutes. We felt the wind shift 180 degrees on the ground, watched flags flutter in opposite directions, and discussed the one landing area available at the base of the mountain. We wondered how flying in the vicinity of winds reported to be 80 knots at 6000 ft would be like. Or whether we should. The rotor cloud overhead roiled angrily to make the point. No, this is definitely not the home field. Back at the airport, NB, one of our most experienced pilots, pointed out the signs of wave activity and resolutely rigged. The winds were still 25K on the ground and he hung back for a while. He was the first to launch at 12:30; no one else was even out of the box. And he was gone. We took a short lunch break and got back to the field, greeted by a reduced surface wind and a flurry of activity. More club members had joined up. Everyone started pulling up to the line. Peter goes in CA, releasing in the wave at 5. NB is back, stories of the wave window stretching in front of him for miles, and effortless climbs to 14K. Sure enough, a call to CA has him out of 13.5, climbing at up to1500 fpm. The day is waning; the lift is not. It's now 4:15, about when things are winding down at most gliderports but here the adrenaline is still flowing. The tows are going to 6000 or so and with just one tow plane, it makes for a long wait. Suited up with all the usual, plus oxygen, a down coat, gloves, electric socks, thermal underwear and boots, you'd think I'd be boiling, but it's just right. After struggling to get settled, the 15 minutes waiting for Gary, our host and tow pilot gave me a chance to plan and think. Rope break, sink, rotor. It's the same, yet it's different. The straight pipe Pawnee pulls well in the cool air as we start the evening tow. Just after breaking ground it feels like I should be hearing the Ride of The Valkyries. Stretching above my left shoulder is a snow-capped mountain about 4000 feet high. A few seconds later, when the time is available to look around, the real mountain shows up, at an impossible angle above the canopy. And Gary calmly turns towards it into the Land of Oz we go. Boy, is this different. Constantly thinking rope break, I leave the decision of where and when to release to Gary. It's not nearly as rough as I hear wave tows can be. Gorham airport, 6 miles north and a little east of Mt. Washington, sits so you can tow without having to go through the rotor, a real boon. It's dried out after the morning's cold front and the peak is visible, along with small parallel clouds stretching downwind. Visibility is 60 miles or more, so towing up in between two of the scattered clouds presents no problem. As we climb in front of a shredded cu at 6000, it gets smooth and Gary radios "This is it." We release and turn right. All hell breaks loose as the wing goes down and the pit of the stomach is the only vario you need. Not that way, stupid! Stuffing the nose down quickly and finishing the turn smoothes it out. Not too much time to find the lift, as I need most of the altitude to get back to the field comfortably and there could be a lot of sink around. I certainly have found some of it. But pointing back at the mountain and speeding up a bit gives a reassuring push on the human vario. The other vario agrees, and starts to sing the song of lift. The altimeter winds up like a clock, and, as it can be in this manic-depressive sport, all's right with the world. Guess I won't need to worry about notching the baro. Having read about what to do is a lot different from doing it. A little faster and the lift falls off. A little slower and that ominous leading edge of cloud gets too close. But it is falling away and diminishing quickly. The averager shows 5.5 knots for minutes on end. Soon the whole of New Hampshire is unfolding below, the airport small but at an easy angle. Magic. We have a half dozen Nutmeggers up. The perspective of altitude is different, but the chatter on the radio makes it more comfortable. We all keep an eye out, as the area of lift is only a few miles square. D7 says he's directly overhead, and a glance up reveals a small, impossibly bright, white cross, gracefully moving across my canopy. Each of us looks for the other in this vast blue canyon, occasional glints of wing the only hint of others up here enjoying the view. It almost seems to be cheating to have this kind of effortless climb. But only almost. It’s a reward for seasons of 1/2-knot thermals over the quarry and low saves just outside the pattern. The tough ones make you come back to do better, the perfect ones freeze a moment of time. As we each reach our ATC ceiling, still climbing strongly and joined by WV, it's time to tip over to more friendly climes. This climb, though, has been friendly enough, good enough for Gold. We share the experiences later, each of us unbelieving of our luck. The companionship enhances our individual enjoyment of the day. The next morning winds are nil, sky clear. Looks like a blue thermal day. Out on the line, everyone who tied out spends as much time cleaning off frost as the others do rigging. The day is weak and even the Old Hats are less than enthusiastic. The pilot meeting demands a picture, all of us commenting on how great it is that so many have shown up. A slow but steady launch sequence has the experienced pilots starting off on the ridge upwind of Mt. Washington, the new guys towing directly to the wave area, with varying degrees of success. Gary was somewhat overwhelmed by our arrival, but he made the turnarounds as fast as possible, wanting us to come back. Nutmeg now has a letter of agreement with Boston Center to allow flights above 18,000 feet. It wouldn't have mattered much that day, as it was one of much scratching. One of us makes it into the wave, slowly working up to 14,000 several times, others towing to it but not having any luck. Go figure. After he came back, they grilled him but he wouldn't squeal. Looked like a case of right place, right time. We had dinner that night in one of this ski spot's many restaurants. The airport may be dinky; the town, decidedly not. We've been joined by The Great Initiators of this trip, Ron Clifford (RQ and RQette), and a half a dozen more. It rounded us out to 13 ships and 17 pilots. War stories abounded. Ron, having established a beachhead at Gypsy's bar, successfully called for reinforcements into the night. A minimum of casualties was reported. Another quiet dawn, the wind calm, a little haze. The forecast had been for overcast skies but we lucked out. The field had settled into a bit of a routine, with those who had tied out turning the ships into the sun like inanimate sunbathers so that the frost would melt. A quick pilot meeting but no rush to launch, as the wind on the summit was less than yesterday. NB went first, as usual, and reported wave to 13. So the day began. The barograph showed how it was. Whereas the first day was the pyramid of Cheops, and the second a sawtooth, this is a gentle sloping plateau. Eventually the Hats clawed their way up from the low tows and joined us NG's who had taken advantage of the earlier, stronger conditions. Six of us hovered at 12.5, split by a hundred feet or so; the eternal climbing contest, noses held high as if sniffing for the elusive smooth lift. The stark rock of the mountain is cut by the Cog railway. Its smoke is designed to tell us where the wind is coming from and where the wave will be. How convenient. We watch as the new arrivals seek out the tempo of this marginal day. Stories abound after we land, another satisfying day done. "I turned off of tow and got into sink so I headed out into the valley." says our 1_34 pilot. "I thought I was doing pretty well heading back to the airport at 4000. Then I hear D7 up at 12 saying he's looking at me and I seem little low. So I started worrying again!" He got back with 3000 feet in the bank and tells how "I sort of wished at one point I could turn the channel and come back later to see how it worked out!" The chance to talk with Rudi Opitz, our clubs resident guru and hall of famer is not to be turned down. But the conversation doesn't start with his usual gentlemanly "How vas your flight?". Not this time. Even he is bubbling over Gorham’s appeal. This time it's "Let me tell you about my flight! It was a very marginal wave, but I knew that if I flew exactly 330 degrees until I was over the mountain, I could turn and know that if I came back to that heading, I would be in lift, even if the canopy started to fog. This is a great site!" And every one had a story and a memory. There were two more days at Gorham, but I had to leave the next morning. As I drove out of the fog that surrounded the field, lenticulars stacked behind Mt. Washington glowed red in the dawn. A good trek. Maybe a Diamond next time. Authors Note: And there was a Diamond the next time. A whole slew of ‘em. And Lennies. And State Records. This story, originally published in the Nutmeg News in January of 1995, was the first of a series of trips made by Nutmeg to Gorham. The wave window is now the property of the FBO at Gorham and is available (with its accompanying restrictions) to all pilots flying from the site. Nutmeg also makes club journeys to Springfield VT in the summer for an annual encampment and has a dedicated group that every year makes a month long safari down the east coast in the spring. Our latest fall sojourn was to Miflin County in the Ridge Country of Pennsylvania and is written up in both our monthly newsletter and the Letters column of Soaring Magazine.